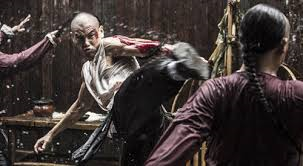 Following Kwan Tak Hing and Jet Li, Eddie Peng (Unbeatable, Jump! Ashin) steps into one of the most iconic roles in Chinese culture in Rise of the Legend. The first Chinese film co-produced by Hollywood studio Universal Pictures, Rise of the Legend also co-stars Sammo Hung, Max Zhang (The Grandmaster), Angelababy (Young Detective Dee: Rise of the Seas Dragon) and Tony Leung Ka Fai. You can buy it on English subtitled (Hong Kong Version) DVD from February 13, 2015. Synopsis: Late Qing Dynasty. Huangpu Port in Guangzhou is over-run by corruption and crime, ruled by rival gangs who exploit the people. One day, a stranger named Fei (Eddie Peng) comes to Huangpu and joins the Black Tiger gang, run with an iron fist by Master Lei (Sammo Hung). After proving himself by taking out Lei's nemesis, Fei becomes one of Lei's most valued disciples. Meanwhile, a band of orphans – led by Fiery (Jing Boran) and Chun (Wang Luodan) – slowly make their presence known in Huangpu by taking down Black Tiger's operations.